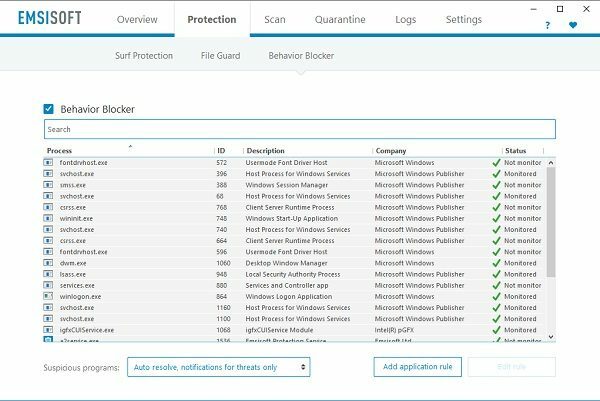 Emsisoft Anti- Malware is a light-weight security software that offers powerful protection for your Windows computers. It ships with a unique dual-engine scanner, offers 4-layered protection, hourly updates against 300000 new threats every day, and advanced malware removal capabilities. Today we take a look at the features that this antivirus software brings to you. It is extremely easy to download the Emsisoft Anti- Malware on your PC. You do not need to register here and can start downloading the program. Once installed, the program offers to continue with the trial version to get the licensed version. Emsisoft Anti Malware works on the dual-engine scanner and is thus efficient enough to detect and remove the hidden trojans, adware, worms, spyware, etc from your PC. Unlike the other such programs, Emsisoft Anti-Malware program gives you a four layered protection against the malware. All of us want to surf the safe websites which don’t land the trojans and spyware on our machines. With Emsisoft Anti-Malware program installed on your PC, you can surf any website without worrying about the Trojans. The program keeps you protected against any such threat which quietly lands on your PC. This feature runs 24×7 and gives you real-time protection against any malware on your PC. It keeps a check on all your downloaded and modified files and keeps your PC protected. There are some trojans and spyware whose signature are not yet known, and it is often difficult to detect such viruses, but Emsisoft Anti Malware continually monitors the behavior of all your programs and takes action as soon as detects any suspicious activity. The program comes with a special Anti-Ransomware protection layer which protects your PC against the Ransomware, which is normally not detected by the regular anti-virus programs. This layer specially designs to detect the difference in the behavioral pattern of the malware before it encrypts your files and demands a ransom against the encryption key. Despite the fact that this program scans your PC with two engine scanners, it works faster than the competitor anti-malware programs. The two powerful scanners are the Emsisoft’s proprietary scanner and the well known Bitdefender Scanner which together make a powerful combination to detect all the hidden and stubborn malware, keyloggers, ransomware, etc on your PC. The powerful duo also avoids the unnecessary duplicate detection, and thus it keeps your PC’s memory uncluttered and clean. One of the various advanced technologies include the signature-based detection wherein the software scans the programs on your PC for their unique signatures which helps it finding the potentially unwanted programs. 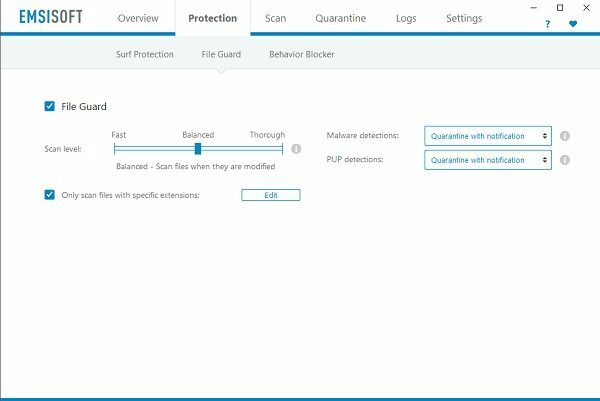 Emsisoft Anti-Malware comes with the advanced scanning feature wherein you can control the scan settings. Some settings here are enabled by default, but you can adjust the settings on your own preferences. a] Quick Scan – This method quickly scans all your programs and their modules and gives you an overview of available threats on your machine. It generally takes 30 seconds to scan your PC. The Quick Scan actually used the technology named Trace Scan which that checks your PC for the traces left behind by malware. This scan method also scans the drivers installed for the active rootkits on your PC. These rootkits hide the registry keys and certain files in a way that regular anti-malware programs can’t detect them. b] Malware Scan – In this method, the program scans the files and folders on your PC which can potentially host the active malware infections in a machine. 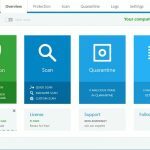 Malware normally installs at certain common areas in a PC, and this powerful scanner of Emsisoft Anti-Malware scans about hundreds of such common areas. 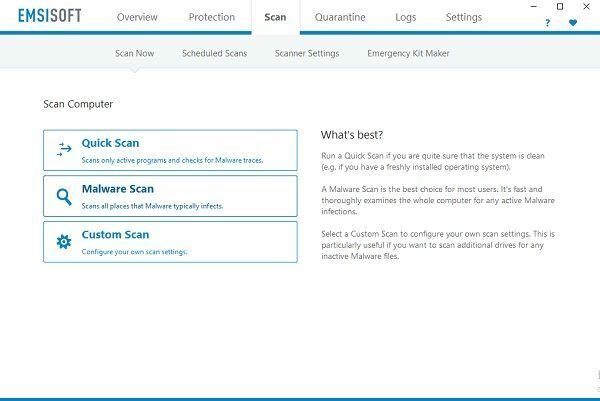 We have put Malware Scan as our default scan method with this program so that the program can scan the suspicious activities and detect the malware instantly before it does any damage to the system. c] Custom Scan – This option makes the program scan your computer thoroughly. Select this option if you want the program to scan all your drives every time. Since this is a thorough scan of all files, folder, and drives, it takes a good amount of time to complete the scan and display of the report. We would recommend using this scan methods once in a few months, and not for daily use. Not just the viruses, trojans, and ransomware, we also need good protection against the annoying adware which peeps into our machines secretly. Most of the time such adware come with some software download and settles on the PC before we even notice it. Emsisoft Anti-Malware helps you in keeping such unwanted browser toolbars and other adware away. It is easy to navigate, and there are no bloats at all. Brings hourly updates regularly against around 300,000 threats every day. Provides outbreak alerts and security knowledge articles. Comes with advanced cleaning and restoration capabilities. Gives you extended logs to check your past actions. 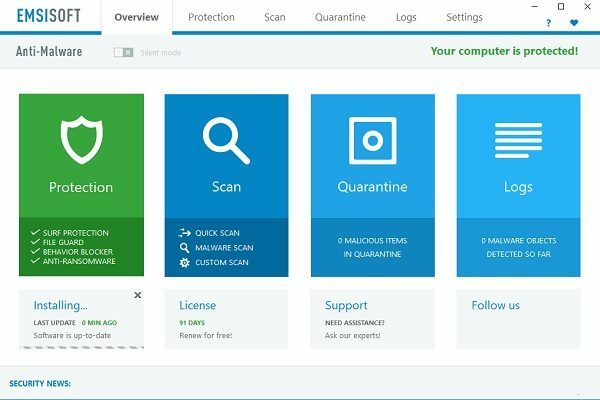 Overall, Emsisoft Anti-Malware gives you the protection against almost every type of threats. It is very quick and accurate and helps you keep your PC clean and protected with its advanced features and modules. The detection rate of this program is quite good. It also asks for your permission before blocking certain programs which is a good feature. It certainly leaves a good impression on us overall and does all that it claims. Scans sometime might take a bit longer, but then the results are accurate. The package is available at USD 39.95 for a one-computer, one-year license. Adding more machines or time will add to the charges. Yes, very good article, and based on my own several years testing/use in wild of various A/V it’s truthful as well. 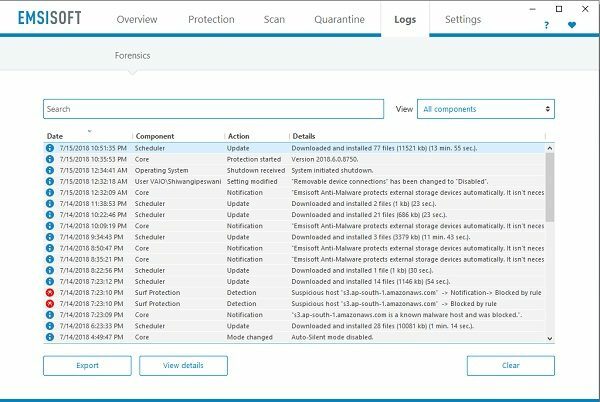 Emsisoft also still offers the free Emsisoft Emergency Kit, a manual second-opinion type scanner only…but it has the same powerful engines as the full suite and does a great job either finding malware or reassuring your own choice of security didn’t let you down. Cheers! P.S. COMODO **must** be configured with “Custom Ruleset”, for its Firewall Settings, in order to run on fully-manual. They do an excellent job, with protecting everything, but it’s “best” to have it with ALL cloud-options completely disabled and prompts asking for everything: 1) Firewall, on custom and 2) Auto-Containment, Enabled and 3) HIPS, Disabled (it’s EXTREMELY difficult to control it manually) and 4) VirusScope, Disabled (if you know what you’re doing, don’t need it to slow down the computer) and 5) Website Filtering, Disabled (because, browsers have this built-in). ^^ Or, you can choose to, just, trust ’em and have it automagically sort everything out for you (with default settings). When you open up SETTINGS, you’ll be able to find all of the “Cloud” options to disable – or, not! Good luck! !